Very Understanding Hubby has a new phone. It took a while to persuade him to ditch the old, knackered one. It's one of these all singing, all dancing things with a touch screen, (want it!) that you can download on to. Very Understanding Hubby, being a bloke, is typically afflicted with The Star Wars Disorder, (don't get me started on films which don't run in chronological order...!) so he was very excited when I downloaded a Lightsaber App for him. I promptly lost interest and forgot about it, disappearing into The Bat Cave. Not long after, there was a Lightsaberish noise behind me, along with various Star Wars themed quotes. I grabbed the nearest thing to hand and brandished my N9 SketchMarkerSword, so battle against The Dark Side could commence. It was a a giggle! Sweet Cheeks was a bit bemused by it all though! Anyway, this is Frankenstein Boy, one of the new releases from Squiggle Stamps. 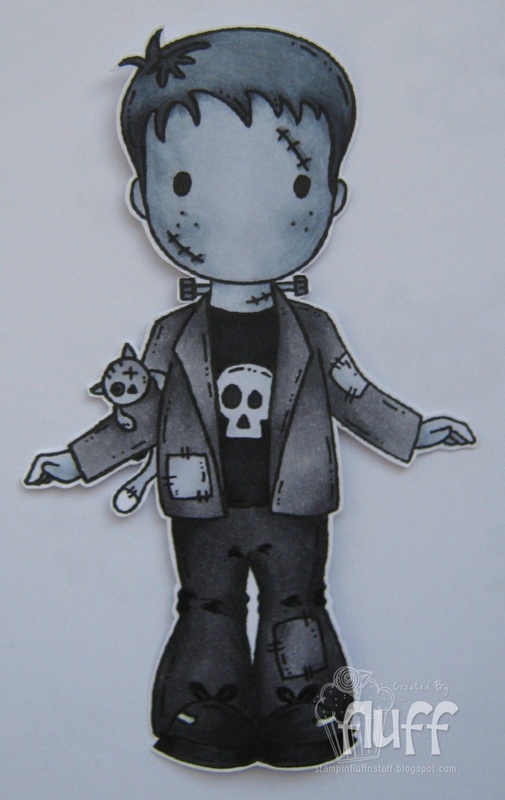 Don't forget there's still time to enter the current Spooky Halloween Fun Challenge over at Squiggles and Giggles. And if you use a Squiggles Image, you can add an extra entry. Brilliant! i love B/W cards! Gorgeous card and gorgeous image. I love it. Fab card love the mono look & its perfect for your image! Good luck against the lightsaber!! Such a sweet card Fluff!!! Just love the black/white combo. That image is just the sweetest! Hmm...Can i place my bet on you girl! !Promarker saber sounds much more dangerous than the lightsaber...*lol* So, is SC you sidekick or DH? Have a fantastic day! Great card Faye! That monochromatic is wonderful, mine would be a big gray blob. And may the force be with you! Hiya Fluffy. Wot is it about blokes and bloody Star Wars!! Don't get me wrong, I am the biggest film buff going and love my films (I have a 500+ dvd/blu ray ollection) only last night I watched Shawshank Redemption....but please Star wars is bonkers, boaring, daft, not in the right order!! (whats all that about!) but the men in our life love it!! Ok give 'em that one then! Sorry...way too much information. Not interested in your husbands 'light-saber' & where he swishes it. Some things should be kept private!!! oh men and their toys Faye...what are they like?? This is fabby, love the grey tones, it's very effective!! gorgeous card Fluffy....your dark colouring is awesome! 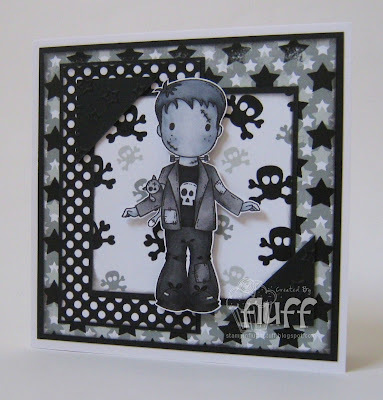 Love the card Faye, the black and white is beautifully made and the colouring is fabulous. He he, all the silly SW quotes are now running in my head...Use The Force Luke! Lols! You're so funny Faye! Gorgeous card! I love the monotone look! Sorry to hear your wee man has been sick... I hope he's better now! WOW Faye, this is BRILLIANT!! What a totally amazing card hon, I LOVE IT, everything about it, LOVE IT!! Hey Faye you have a hubby with taste, Star Wars is brilliant, well the first three were not so keen on the new ones. I used to have the Stars Wars music, wallpaper and a phone case when I had an old Nokia phone, I was sad to see it go, lol. Anyway I digress, I love, love your card that image is a cutie and what fantastic colouring a superb card. Wow, was für ein tolles Werk. Ich bin begeistert. Great card and the perfect image for our challenge, love the black and white so used to seeing the normal orange, purples etc it threw me at first. Thanks for joining us this week at Crafty Sentiment Designs.